For articles with similar names, see Voices (disambiguation). The Voices is a 2014 black comedy horror film directed by Marjane Satrapi, written by Michael R. Perry, and starring Ryan Reynolds, Gemma Arterton, Anna Kendrick and Jacki Weaver. It had its world premiere at 2014 Sundance Film Festival on January 19, 2014. The film was released in a limited release and through video on demand on February 6, 2015, by Lionsgate. It received positive reviews from critics. Jerry (Ryan Reynolds) is an upbeat man who works at a bathtub factory, and lives in a modified apartment above a bowling alley with his dog, Bosco, and his cat, Mr. Whiskers. Jerry is a schizophrenic who chooses not to take his medication and enjoys delusions and hallucinations that manifest in the form of his pets talking to him. Bosco often represents his good intentions while Mr. Whiskers represents his more violent nature. Jerry has a workplace crush on an English woman named Fiona. She stands him up to go to a karaoke party with two other women from work, Lisa and Alison. Fiona's car doesn't start, leading her to flag down Jerry as he drives by. Jerry accidentally hits a deer which crashes through his windshield. Jerry's hallucinations show the deer convincing Jerry to cut his throat. Jerry does as told. Fiona, terrified, runs off into the woods. Jerry chases her to explain but ends up tripping over Fiona, and accidentally stabbing her. As Fiona starts gurgling blood, Jerry tearfully apologizes for hurting her and that he loves her. To end her pain, Jerry stabs her again, and she dies. Upon returning home, Bosco suggests he has to go to the police and confess, while Mr. Whiskers says there is no shame in killing, but insists Jerry needs to dispose of the body. Jerry collects Fiona's body but leaves a bloody shoe and pile of organs. He dismembers Fiona, placing her innards in numerous Tupperware containers and her decapitated head inside his fridge. His delusions increase and Fiona's severed head comes to life and starts talking to Jerry. Jerry apologizes about Fiona's death. Fiona doesn't approve and tells him about the good life she's had before she died. Fiona then demands Jerry take his medication. Jerry takes his pills, and the next day, he experiences nightmares of his abusive past. When he wakes up his hallucinations have ended; his pets no longer speak to him, his apartment is a mess, with animal waste littering the floor, garbage, and blood all over his kitchen. Fiona's head is cold and rotting. He throws away the pills in terror, and the next morning, his hallucinations return and his happy life is back to 'normal'. Fiona tries to convince Jerry to kill another being so she has a friend. Jerry asks Lisa on a date. He takes her to his abandoned childhood home, where it is revealed his German mother had confessed to her insanity and was about to be taken away by the authorities when he was a child. When they arrived, she decided to commit suicide by trying to slit her throat, but couldn't do it herself and so she begged Jerry to finish the job to end her suffering. The police found Jerry standing over his dead mother and he was committed instead. Jerry sobs in front of Lisa, who comforts him. They go to her house and spend the night together. Lisa goes to Jerry's house. She wanders in and discovers the state of the apartment including all the contained guts, blood stains, and Fiona's decapitated head covered. Despite pressure from Mr. Whiskers, Jerry refuses to kill her. Jerry tries to explain the corpse meat but Lisa flees and hides into the bathroom. When Jerry breaks in, Lisa starts hitting him with a towel hanger and runs to his room. Jerry tries to calm her with an apology which she seems convinced. When she then tries to escape, Jerry throws her onto the bed, causing the back of her neck to hit a shelf, badly breaking it. After she dies, Jerry chops her head and places it in the fridge, next to Fiona's. Other workers begin to realize Fiona and Lisa have gone missing. When Alison goes to Jerry's house, Jerry immediately kills her, taking her head as well. Jerry confesses his killings to his counselor Dr. Warren. She tries to call the police, but he takes her hostage into the countryside and forces her to help him. She calms him down and shows understanding. Meanwhile, the other workers from accounting break into Jerry's home, while Bosco runs away, and immediately retreat to call the police. Shortly after Jerry returns home, still holding Warren hostage, the police surround his house and prepare to move in. Jerry flees down into the basement, breaking a gas pipe while doing so. After rescuing Dr. Warren, the police are knocked back from a huge explosion caused by the gas leak. Jerry realizes the bowling alley is on fire and he is in grave danger. The voices of Bosco and Mr. Whiskers, no longer taking forms of belonging to a dog and cat no longer with him, speak to him in his own mind, Mr. Whiskers is insisting he get out of there and find another place to live, to hide, so that he may continue killing and feeling alive, and Bosco telling him that there is no place for him in life any longer and that he should let the fire "put him to sleep". Choosing to stay and end his own misery, he lies down and waits until he blacks out from the smoke. In a white void, Bosco and Mr. Whiskers confess that, despite their opposing beliefs, they did like each other, before going their separate ways. Jerry then appears with his parents, Fiona, Lisa and Alison, and he apologizes to the women for killing them. Jesus appears, and they all dance and sing together. Before initial production, the script for the Voices was incredibly praised including being listed on The Black List's Best UN-produced Screenplays of 2009. The film originally had Mark Romanek attached to direct The Voices back in 2010 with Ben Stiller set to act as Jerry Hickfang, but was never made due to the budget issues. The project was brought up again in August 2012, when it was announced that Marjane Satrapi will be directing the black comedy instead. When asked about casting Ryan Reynolds in the leading role, Satrapi stated in an interview with Digital Spy, "At the beginning, the producer and myself said let's look for an actor, and then Ryan made the voices on his iPhone and he sent it over, and I was like, "Who is that?" And suddenly it makes sense. That is the voices the guy hears, so who else but him can do it? It can only be him, so, yeah, it was an obvious choice." Principal photography began in April 2013 in Berlin, Germany. The film had its world premiere at the Sundance Film Festival on January 19, 2014. on March 5, 2014, it was announced Lionsgate had acquired distribution rights to the film. The film screened at the Toronto International Film Festival on September 11, 2014. The film was then released on video on demand and in limited release on February 6, 2015. In the film's opening weekend the film made $5,000. 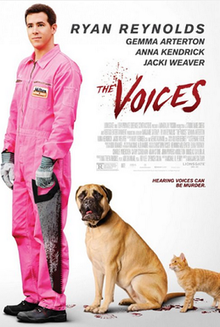 The Voices received generally positive reviews. On Rotten Tomatoes the film has an approval rating of 74% based on 85 reviews, with an average rating of 6.6/10. The website's critical consensus reads, "The Voices gives Ryan Reynolds an opportunity to deliver a highlight-reel performance—and offers an off-kilter treat for fans of black comedies." On Metacritic, which assigns a rating, the film has a score 58 out of 100, based on 24 critics, indicating "mixed or average reviews". Brad Wheeler of Canada's The Globe and Mail gave the film three out of four stars and stated that, "Think of this stylish, quirky and quite grisly feature from Marjane Satrapi as a meeting of Psycho, Dexter and Dr. Doolittle." 20th annual L'Etrange Festival in Paris bestowed two awards on the film: the Canal+ Nouveau Genre Award (the festival's Grand Prize) and the equally prestigious Audience Award. 2015 Festival International du Film Fantastique de Gérardmer granted two more honors to the film: the Audience Award and the Jury Award. ^ "THE VOICES (15)". British Board of Film Classification. February 2, 2015. Retrieved February 3, 2015. ^ Audrey (March 12, 2015). "[Interview] Rencontre avec Marjane Satrapi, réalisatrice de The Voices". GentleGeek. Retrieved April 11, 2018. ^ a b "The Voices (2014)". The Numbers. Retrieved January 24, 2016. ^ IndieWire (January 10, 2014). "Sundance 2014: World Cinema Dramatic Competition". IndieWire. Penske Business Media. Retrieved May 5, 2014. ^ Miska, Brad (January 6, 2015). "Lionsgate Hears 'The Voices' This February". Bloody Disgusting. Retrieved October 1, 2017. ^ Fischer, Russ (December 11, 2009). "The Black List 2009 The Years Best UN-produced Screenplays". /Film. Retrieved April 11, 2018. ^ Jagernauth, Kevin (August 7, 2012). "Persepolis' Director Marjane Satrapi Takes On 'The Voices' Formerly Linked To Mark Romanek & Ben Stiller". IndieWire. Pensje Business Media. Retrieved November 21, 2016. ^ Dibdin, Emma (March 18, 2015). "The Voices: Director Marjane Satrapi on casting Ryan Reynolds against type". Digital Spy. Hearst Magazines. Retrieved April 11, 2018. ^ Duff, Seamus (April 22, 2013). "Ryan Reynolds takes a break from filming in Germany to grab dinner with co-star Gemma Arterton". The Daily Mail. Associated Newspapers. Retrieved July 15, 2013. ^ Roxborough, Scott (April 23, 2013). "'Silver Linings' Actress Jacki Weaver Joins Marjane Satrapi's 'The Voices'". The Hollywood Reporter. Prometheus Global Media. Retrieved July 15, 2013. ^ Sollosi, Mary (January 23, 2014). "Sundance Review: Ryan Reynolds Makes A Crazy Comeback Wit". IndieWire. Penske Business Media. Retrieved April 11, 2018. ^ Sneider, Jeff (March 5, 2014). "Ryan Reynolds' Sundance Thriller 'The Voices' Acquired by Lionsgate (Exclusive)". TheWrap. Retrieved April 11, 2018. ^ Joanna (September 12, 2014). "Ryan Reynolds in The Voices: TIFF Review-Lainey Gossip Entertainment Update". Lainey Gossip. Lainey Gossip Entertainment. Retrieved October 1, 2017. ^ "The Voices (2015)". Rotten Tomatoes. Fandango Media. Retrieved April 11, 2018. ^ "The Voices Reviews". Metacritic. CBS Interactive. Retrieved January 12, 2017. ^ Wheeler, Brad (February 20, 2015). "The Voices: A black comedy mashup between Psycho, Dexter and Dr. Doolittle". The Globe and Mail. Retrieved November 21, 2016. ^ Croll, Ben (September 15, 2014). "L'Etrange 2014: THE VOICES Speaks To Voters At Festival's End". Screen Anarchy. Retrieved October 1, 2017. ^ "22e édition du Festival International du Film Fantastique de Gérardmer" (PDF). Festival international du film fantastique de Gérardmer. Retrieved October 1, 2017. This page was last edited on 11 March 2019, at 15:53 (UTC).